As Beatlemania sweeps across the world again, we're reminded of an earlier era when sheer talent and dogged determination paved the way to success. In 1975, Sugarloaf chronicled their struggle for a record deal with the cheeky "Don't Call Us" - rocketing to #9 on the US charts. In the song, one of the label excuses is that it's all been done before by a certain John, Paul, George and Ringo - and funny enough, the publishing to the song was subsequently bought by Paul McCartney via his MPL Communications (Sir Paul certainly knows something about a hit record). "Don't Call Us" was originally a dig at CBS Records who had turned the band down - Sugarloaf persisted and scored other hits, including the classic rock staple, "Green Eyed Lady" (#3, 1970). 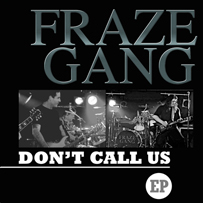 Fraze Gang are no strangers to the charts themselves as singer/guitarist Greg Fraser penned several AOR hits for Canadian hair metal stalwarts Brighton Rock ("Can't Wait For The Night", "Hangin' High & Dry", "We Came To Rock" etc), picking up several Gold albums along the way. Now, alongside powerhouse drummer Phil Epp & fellow Brighton Rock alumni bassist Stevie Skreebs - - Greg Fraser updates "Don't Call Us" for the current era of instant stars and celebrities, auto-tune software, and TV talent shows to let us know that ultimately it's raw talent, hunger and determination that still lead the way to the top. "Don't Call Us" is the lead track from their digital only EP, available on iTunes and elsewhere.